The election is over! Hooray! Now that we no longer have to see campaign commercials every six seconds explaining how the other guy wants to raise your taxes 78% or sell your children into slavery, let’s take a final look at how churches handled the election this year. A true majority of you, 51%, are just encouraging people to vote. Some churches registered people during services or nagged their attenders on a weekly basis, but their goal was merely to have their people be voting people. 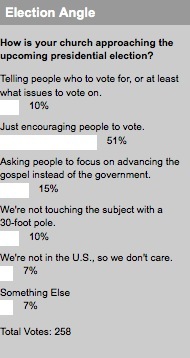 15% of you are asking people to focus on advancing the gospel rather than advancing the government. Your hope is in the cross, and whatever happens in the presidential race will happen. Two groups of you are knotted at 10%. That’s the respondents who are telling their candidates who to vote for or what issues to vote on. And another 10% of you are running from politics like it’s the plague. The latter is probably the best for those government-fearing nonprofit status-loving churches out there. A big 7% of you are outside of the U.S., so you couldn’t care less. To you, we say “Cheers” or “Namaste” or “Habari” or whatever your nation likes to say. It’s great to have you reading! And 7% of you went with “Something else,” which is a great reason for you to go ahead and head to the comments. This week, we want to know: Who is in charge of managing your church’s communication?